FIGURE 1. 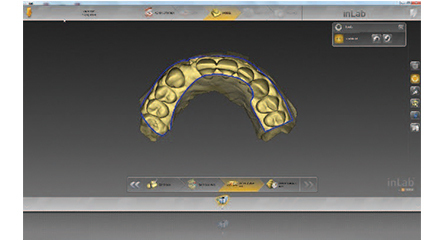 A digital scan of the case using Dentsply Sirona’s Omnicam and CEREC 4.4 software on the edentulous site. FIGURE 2. Special software was used to design an accurate visual representation of the proposed final restoration. 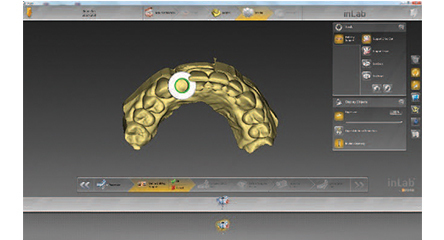 The virtual wax-up design was imported as an *.ssi file and sent to the GALILEOS cone beam computed tomography (CBCT) reading workstation. FIGURE 3. 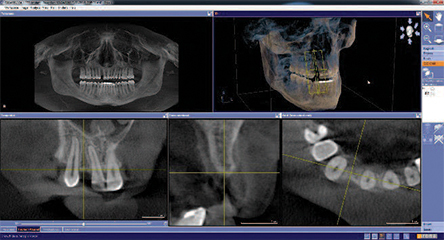 Using SIDEXIS 4.0 integrated imaging software, the CBCT scan was acquired. The scan provides three-dimensional diagnostic imaging for comprehensive dentistry and diagnostics. FIGURE 4. 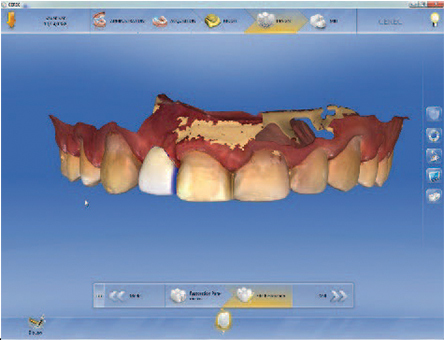 The *.ssi file from the digital wax-up was integrated within the implant software. integrated into the CBCT scan. Research by Al-Fadda et al9 comparing the accuracy of conventional cast frameworks and implant-prosthodontic frameworks designed and manufactured using laser scanning and computer numeric controlled (CNC) technology helped confirm the clinical utility of CAD/CAM technologies. By using a contact-type coordinate measuring machine and a computer program developed specifically for the purpose of their study, nine cast frameworks and nine milled frameworks were fabricated and tested for accuracy. When compared with conventional frameworks, the results showed that laser-scanned CNC-milled frameworks presented significantly less distortion along the X-axis, as well as on the horizontal plane. To conclude, Al-Fadda et al9 noted that “within the limitations of this study, fabrication an of implant-prosthodontic framework using the CNC milling technique yields a more accurate fit than the currently used cast technique.” This study confirms that dental items designed and manufactured CAD/CAM technology are not only clinically sound, but may be even more accurate than those created using more traditional methods. Furthermore, considering this study is now more than a decade old, it is reasonable to expect that digital dentistry been refined and improved since then. restoration with the planned implant. In today’s practice, CAD/CAM technology is frequently a foundational element of an integrated digital workflow for dental implant placement and restoration. 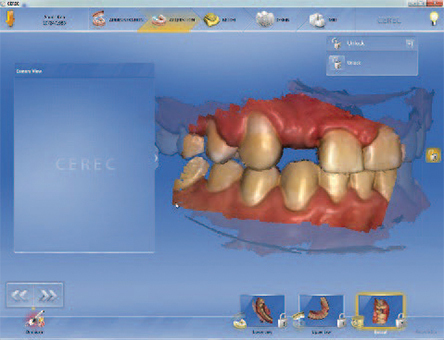 This technology includes an intraoral scanning system, cone beam computed tomography (CBCT), implant planning software, and CAD/CAM design and milling software and hardware. 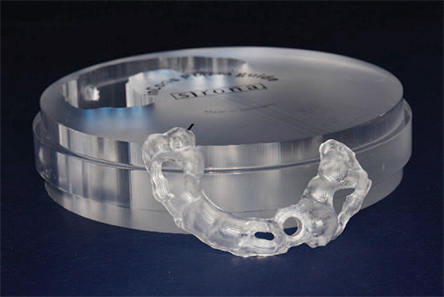 It is important to note this is not an all-or-nothing proposition, as a dental office that does not have in-office designing, milling or three-dimensional (3D) printing capability can still use a digital workflow by partnering with a dental laboratory.10 On the other hand, offices that fully embrace digital dentistry can typically handle all aspects of implant treatment planning, fabrication and delivery on site. By way of example, this paper will present the workflow used in the authors’ practice. the in-house inLab 15 SW laboratory partner. The first step in an implant CAD/CAM workflow is to acquire a digital scan of the patient’s case through optical impressions (Figure 1). This will include intraoral scans of both hard and soft tissues, including the edentulous site of the patient. 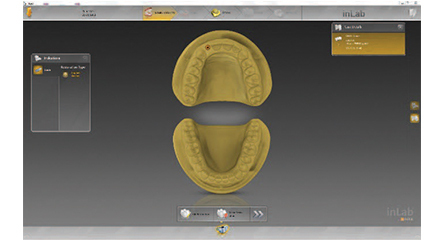 Software is then used to design a virtual tooth to fit within the patient’s edentulous site as a part of the digital wax-up (Figure 2). Next, the design is imported into software for integration with the CBCT data. 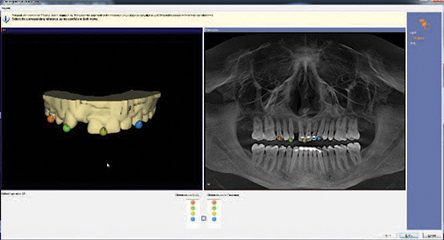 Integrated imaging software allows the patient’s CBCT scan to be acquired and used alongside the digital wax-up (Figure 3 and Figure 4). 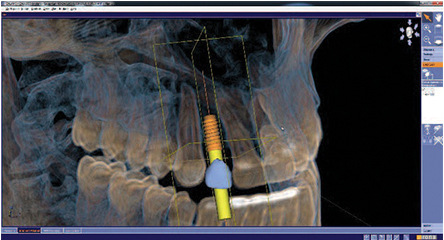 Once the wax-up is integrated into the CBCT scan (Figure 5), treatment-planning software allows the clinician to virtually plan 3D placement of the implant (Figure 6). Besides its utility in placement planning, the software can also show the clinician a cross-sectional image of the restoration on the patient’s scan (Figure 7), as well as a volumetric analysis of the implant planning (Figure 8). Once the comprehensive im­plant plan is established (Figure 9), a surgical template can be digitally designed and manufactured via milling or 3D printing technology. 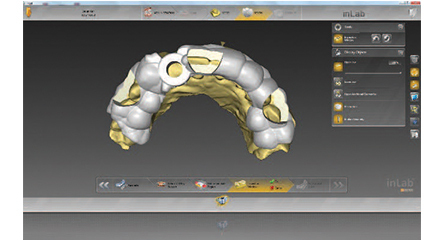 The digital model can be trimmed, parameters set for the specific fit and thickness of the surgical template (Figure 10 and Figure 11), and the preferred material can be selected — all directly within the software. When using milling technology, software can even show the positioning of the surgical guide within the material disc prior to milling. Providers can also use digital sleeve and design tools to further refine the guide prior to fabrication (Figure 12 and Figure 13). Once all planning is complete, the milling machine will produce a highly customized guide that was designed using the patient-specific digital workflow (Figure 14 and Figure 15). guide from the milled disk. guide ready for guided surgery. Considering that digital dentistry using CAD/CAM treatment planning and delivery of implants and restorations shows positive results, including a high level of accuracy and durability,2–9 it is becoming a clear choice over traditional means of production. The convenience, time saving and efficiency of designing and fabricating a solution that can quickly and easily be modified or replicated on site are just a few of the advantages of using CAD/CAM dentistry. With the field poised for further advances, an integrated digital workflow has earned its place as a viable — and even preferred — clinical modality in modern implantology. Zulhazreen M. The History of CADCAM. Available at: scribd.com/document/46598156/The-History-of-CADCAM. Accessed October 8, 2018. Masri R, Driscoll CF, eds. 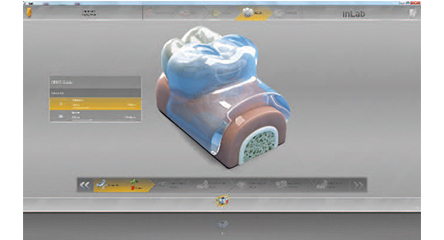 Clinical Applications of Digital Dental Technology. Hokobken, NJ: John Wiley & Sons; 2015. Di Giacomo G, Cury PR, de Araujo NS, Sendyk WR, Sendyk CL. Clinical application of stereolithographic surgical guides for implant placement: preliminary results. J Periodontol. 2005;76:503–507. 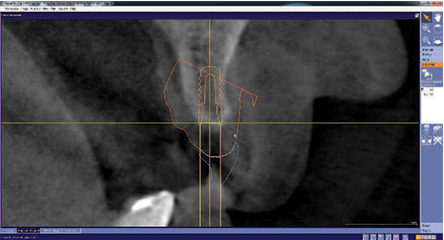 Van Assche N, Vercruyssen M, Coucke W, Teugheis W, Jacobs R, Quirynen M. Accuracy of computer-aided implant placement. Clin Oral Implants Res. 2012;Suppl 6:112–123. Hack G, Patzelt S. Evaluation of the accuracy of six intra-oral scanning devices: An in-vitro investigation. J Am Dent Assoc. 2015;10;1–5. Chochlidakis KM, Papaspyridakos P, Geminiani A, Chen CJ, Feng IJ, Ercoli C. Digital versus conventional impressions for fixed prosthodontics: a systematic review and meta-analysis. J Prosthet Dent. 2016;116:184–190. 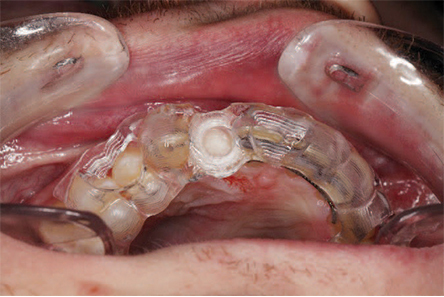 Otto T. Computer-aided direct all-ceramic crowns: Preliminary 1-year results of a prospective clinical study. Int J Periodontics Restorative Dent. 2004;24:446–455. Otto T, Schneider D. Long-term clinical results of chairside CEREC CAD/CAM inlays and onlays: a case series. Int J Prosthodont. 2008;21:53–59. Al-Fadda SA, Zarb GA, Finer Y. A comparison of the accuracy of fit of 2 methods for fabricating implant-prosthodontic frameworks. Int J Prosthodont. 2007;20:125–131. Choi SK. Digital technologies for restorative care; Part 1. Decisions in Dentistry. 2018;4(5):33–36. Sophia Fratianne, MA, has no commercial conflicts of interest to disclose. Neal Patel, DDS, has previously received honorariums from Dentsply Sirona but not in connection with this article. From Decisions in Dentistry. November 2018;4(11):24,26–27. Neal Patel, DDS, is an international educator in digital dentistry, including CAD/CAM, cone beam computed tomography, virtual surgery and computer-guided implantology. He practices general dentistry in Powell, Ohio. He can be reached at drpatel@infinitesmiles.com. Sophia Fratianne, MA, was formerly the editor-in-chief at Infinite Smiles.